There are leaders who do not question the misapplication of disconnected assumptions. Their ideologies drive them, not factual information. Understanding that, one can begin to comprehend what has been done to teachers, schools, and education in the name of accountability. No Child Left Behind is a program the Bush administration mandated that was not based upon information about curriculum, learning, or knowledge about what schools do. It is a program based upon the stupid assumption that teachers, schools, and educational programs can be accurately evaluated by reading and math scores. In fact, the tests allow politicians and administrators to justify actions and feel more in control through manipulated statistics. Now, teachers all over the country are being forced to teach to limited, invalid tests meant to measure student, teacher and school proficiency. These tests, used to punish and placate, are worthless. The real political intent of these politicians is to destroy interdisciplinary comprehensive fact-based pubic schools and privatize education in order to access our education tax dollars. Greed, not accountability drives this disaster. 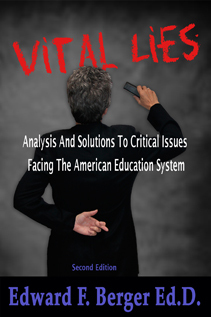 Beware of every for-profit school or educational program. Save the American education system.